A day of incidents brought us to the frontier town of Mae Sot, our crossing point for Burma. Several crews were in difficulty today but looked to be in good spirits at the Rally Dinner out on the lawn of the Hill Resort Hotel. Marking our arrival, fireworks are going off into the night sky as your intrepid reporter endeavours to file his report for you. The day began with our final closed-road timed Test-section, a short but very dusty track snaking through dense undergrowth, which naturally was called “The Thai Decider”. The quickest car proved to be the Datsun 240Z of Grant Tromans and Simon Russell, setting a time of 3:46, Gerry Crown had the big Leyland sliding on the gravel round the corners and with Matt Bryson set a time of 3:51, and Peter and Zoe Lovett’s time in the 911 was a more cautious 4:03. Ludovic Bois, who is now fourth overall in his Volvo Amazon, having overhauled the Merryweathers, set 4:02. In the Vintage Category, the duelling Chevys of Bill Shields saw a Bill set a time of 4:09, Phil Garratt on 4:18, Rudi Friedrichs posted 4:29 in the Alvis, Daniel Day spun in front of your reporter and landed in the bushes, and then saw seconds tick away finding reverse gear, posting a time of 4:30. It was an eventful day for some. 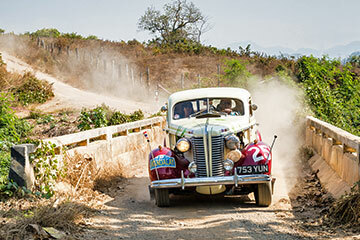 The Mercedes Ponton of Clemens Lansing had to be towed up a particularly steep hill by one of the Organising team Toyotas, Rudi Friedrichs came to the rescue of Australian pride when fellow Alvis driver Michael Wilkinson was sidelined with a broken gear-lever. Rudi got the car going again using a spanner as a replacement gear-lever. The Model A Ford of Roger Anderson also had to be towed up a steep hill by Clerk of the Course John Spiller. Hans Middleberg’s Ford Mustang, is being repaired in a local workshop after breaking its rear axle – several cars have suffered axle issues on this event – but the Volvo PV544 of Nicholas Pryor completed a steady run through the Test this morning and has arrived without further incident after over-night axle repairs when the axle tubes came away from the differential. The car will be resuming the competition, much to the relief of navigator Lesley Stockwell who feared it was heading for retirement. Perhaps the biggest drama of the day concerned the Maigret Citroen of Mario Illien. The car stopped abruptly on the Test-section with a front wheel leaning over dramatically – it looked as if the wheel had come off. With the help of Jim Allen from the film-unit, the car was patched up with competing cars covering the two of them in dust, and limped out of the Test with suspected broken king-pin, but Mario was hammering away during the lunch break and got the car mobile again to reach the hotel here tonight on time - having lost no time penalties in the afternoon run. It’s a day off tomorrow while the organisation completes border-formalities for our crossing into Burma on Friday. 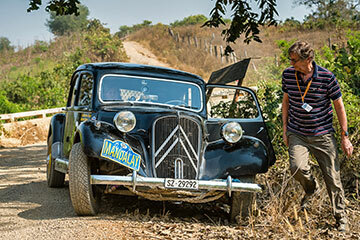 The word is that the single-lane mountain descent from the Burma frontier will be particularly challenging, not least because the first few kilometres are littered with severe potholes. The rumour-mill suggests these are more like knee-deep craters. Still, having got this far, nothing is going to stop us now.